Every so often, there is a film that gets ever so close to perfection but ultimately falls just shy of that hallowed ground. For me, Ben is Back is the latest film to make that journey. That's not to say that Ben is Back isn't a great film. It is. That's also not to say that I didn't enjoy the movie because I absolutely did. No, Ben is Back had the potential to be a truly remarkable movie that has a generational impact, but there's one thing that hinders its aim. Unfortunately, it is also something that I can't really talk about without completely spoiling the movie. Ben is Back is so good, that I don't want to spoil it for anyone, but I would be interested to have a conversation with others after they watch it and see if they have the same major critique that I had with the film. Ben is Back follows a young man who returns home from rehab on Christmas Eve and encounters a loving, but cautious family. With a return to rehab coming in 24 hours, the family must come to grips with their prodigal son's return and the unseen impact of his reentry into their lives. This is a movie that is primarily about a boy and his mom. Lucas Hedges plays the aforementioned drug-addicted son, while Julia Roberts gives an awards-worthy performance as his mother. As a father of two young children, this film represents one of those worst-case scenarios that haunt my dreams occasionally. While our kids are young, we think that we can shield them from the perils of the real world around us, but as they get older, it becomes increasingly obvious that this belief is naive. For Julia's Holly, her misconceptions about her son are the depth of his addiction are uncovered along the way and she finds herself spiraling out of control. Any parent can put themselves in Holly's shoes and empathize with her as she slowly starts to lose her mind over her son's antics. But the love for her son is the prime motivator for her and Julia gives a rousing performance that is spooky in terms of how true it comes across on the screen. The scene in the police station alone makes this film a must-see for any parent. The titular Ben is played by Lucas Hedges and he is building quite the impressive resumé. As I watched him in Manchester by the Sea and Boy Erased, it never dawned on me that he was the real-life son of filmmaker Peter Hedges. I mean, I should have made the connection, but I'm really bad with those things. Anyhow, it's no longer a surprise to me as to why Lucas is such a talented actor. Having grown up around his father, it was only natural that some of his brilliance would rub off on his son. 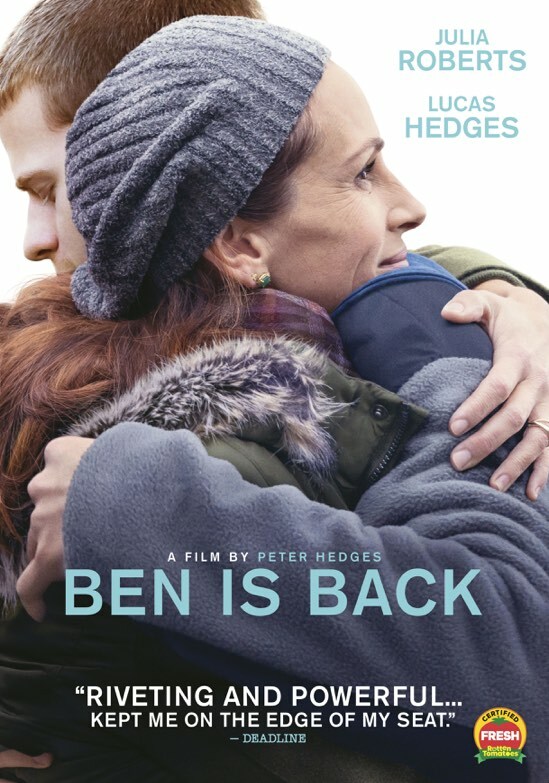 Peter Hedges wrote and directed Ben is Back, so the familial angst that courses throughout the film is very real and the result is nothing short of spectacular. Lucas continues to demonstrate why he is one of the most talented young actors working in Hollywood today and he more than holds his own in his many scenes opposite of Julia Roberts. They both bring a certain gravitas to the film that tends to hit home with any parent in the audience. Let's face it, the things that Holly experiences over those 24 hours are nightmare-inducing for any parent, let alone one that is as overbearing in her love as Holly comes across. Again, I have to end where I started this review. I found Ben is Back to be a truly great film, but there was one niggling element that I bothered me. It wasn't enough to completely sour my enjoyment of the movie, but it was a rather substantial choice that I think undermines some of the story's resonance. Of course, anyone can be an armchair director, but ultimately the film's choices are made and we must live with them. 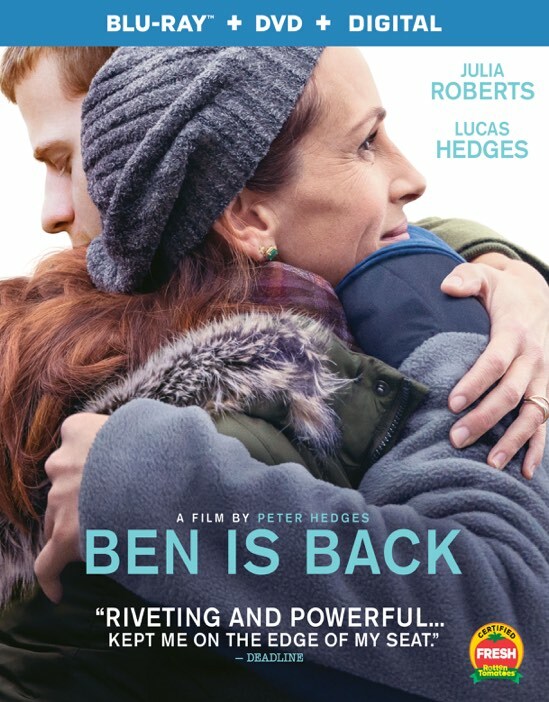 That said, I would recommend that every parent should watch Ben is Back and if you can convince your teenager to watch it with you, even better. Ben is Back is a cautionary tale for parents everywhere, one in which the dangers of walking that tightrope between being over and under protective is spotlighted. It's a tricky balancing act to be sure, but it's an important one that may very well have real life and death consequences. Ben is Back is now available on Blu-ray and DVD.